All Natural 3 in 1 Garden Insect Spray is a special mix of miticidal, insecticidal, fungicidal compounds blended to provide a broad-spectrum anti-respiration solution for total insect, mite and disease control. All Natural Insect Spray further acts by creating a residual barrier layer on plant surfaces providing long-term protection. All Natural Insect Spray is effective when applied any time throughout the growing season. It is effective against all stages of insect and mite development from nymphal stage or adult. When applied early. All Natural 3 in 1 Insect Spray is a good choice for preventative disease and insect control. It is active over a wide range of temperatures and can be used as the last spray before harvest if populations need to be reduced. All Natural Insect Spray is available in a standard 16oz bottle or a 16oz ready-to-spray hose end applicator bottle. 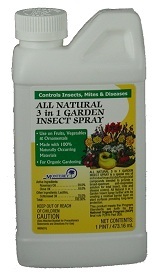 Would you like to see the All Natural 3 in 1 Garden Insect Spray Label? How about the All Natural 3 in 1 Garden Insect Spray MSDS sheet?